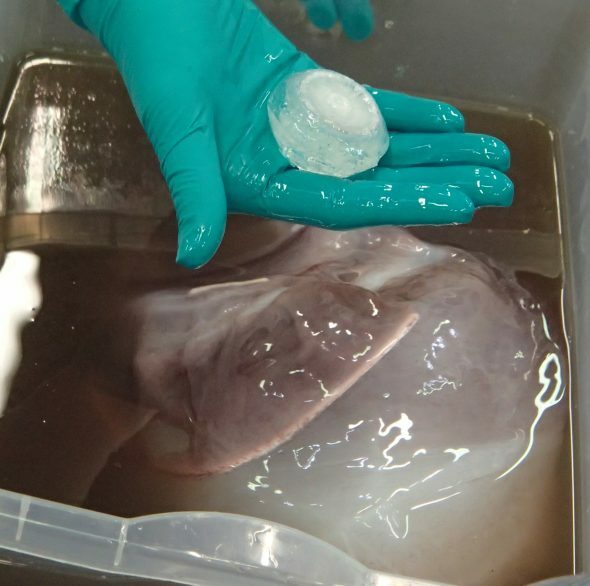 Te Papa’s second colossal squid, Mesonychoteuthis hamiltoni, is part of the displays for the upcoming Te Papa Open House on 25th July 2015 – a part of the 150th celebrations for the Wellington City as capital of New Zealand. The squid was caught in the Ross Sea in early 2014, by Captain John Bennett on board the San Aspiring, a New Zealand vessel fishing for toothfish in New Zealand’s Antarctic fisheries. In September 2014 this squid was made ready for long-term storage in Te Papa’s natural history collections. Some of the recent research findings from the science team working on the squid are now available. Much of the research programme has been conducted by Auckland University of Technology’s (AUT) Lab for Cephalopod Ecology & Systematics – (ALCES), led by Dr Kat Bolstad. The lens and eye of the colossal squid are examined by researchers during the preparation of the specimen for its longterm storage in the Te Papa natural history collections. Photograph Alison Ballance; Copyright Radio New Zealand. Though we still know little about the diet of the colossal squid, research published in 2015 by Remeslo and colleagues suggest the Antarctic toothfish, Dissostichus mawsoni, prey upon juvenile, injured or dying colossal squid despite the adult squid being much larger than the fish. The squid feed on Antarctic toothfish in their turn, presumably once they’re large enough to do this without risk of being eaten by their quarry. This means that, at some point in time, the predator becomes the prey and vice-versa. We are hoping that the stomach contents taken from this specimen will help to further answer questions about this diet of this colossal animal. This new information about the trophic relationships and their possible inversion half way through a life-cycle highlights the importance of protecting populations of Southern Ocean animals, as we are unsure how changes in ecosystems can impact on the animals which depend on one another for food. 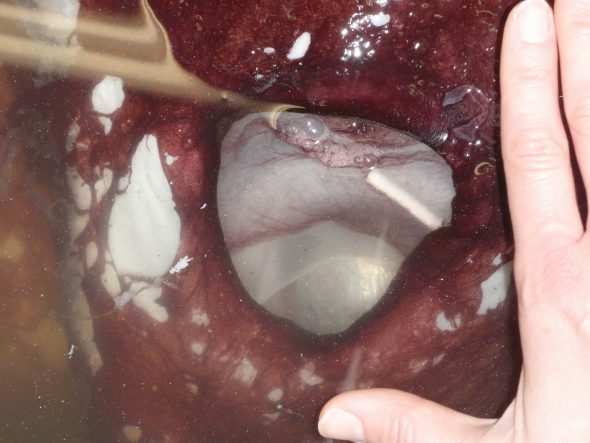 The 2014 colossal squid specimen was in extremely fresh condition and had been carefully handled during its accidental capture in Antarctic toothfish fisheries, meaning that its anatomy and details of its biology were much easier to examine for squid biologists than with previous specimens. Image: Aaron Boyd Evans; Copyright ALCES. A whole team of researchers around the world are working to answer some of the mysteries surrounding the colossal squid. So far, 19 projects in 12 countries are analysing samples from the squid specimens held at Te Papa, looking at topics as diverse as egg development, physiology, and genetics. 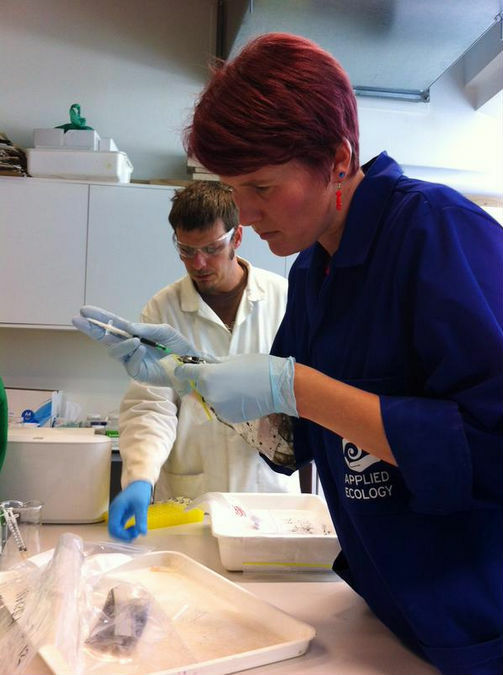 For example, Dr. Chris Pook is doing biochemical analyses of the ink of colossal squid and other deep-sea squids (e.g. giant squid) and has found that they have chemical properties that ‘confuse’ the olfactory senses of predators, making the ink not just a smokescreen but a “nose-screen” too! Dr Kat Bolstad (foreground) of AUT’s ALCES group extracts squid ink from the latest Te Papa colossal squid specimen. Dr Chris Pook prepares specimen samples (background). Photo: Aaron Boyd Evans; Copyright: ALCES.